A while ago, when Borders book stores were about to close their doors, they were blowing out all of their merchandise. Needless to say, I totally stalked the cookbook section, buying a lot more books than I should probably admit to. Most notably, I picked up a copy of Mark Bittman’s encyclopedic book, How To Cook Everything. It was only today that I realized that I’ve never actually made a recipe from it. Don’t get me wrong. I read the book (almost) cover to cover. I learned tons and tons from it. I’ve gotten ideas from it. But today I finally took it down to make a recipe. This is one that intrigued me every time I saw it. 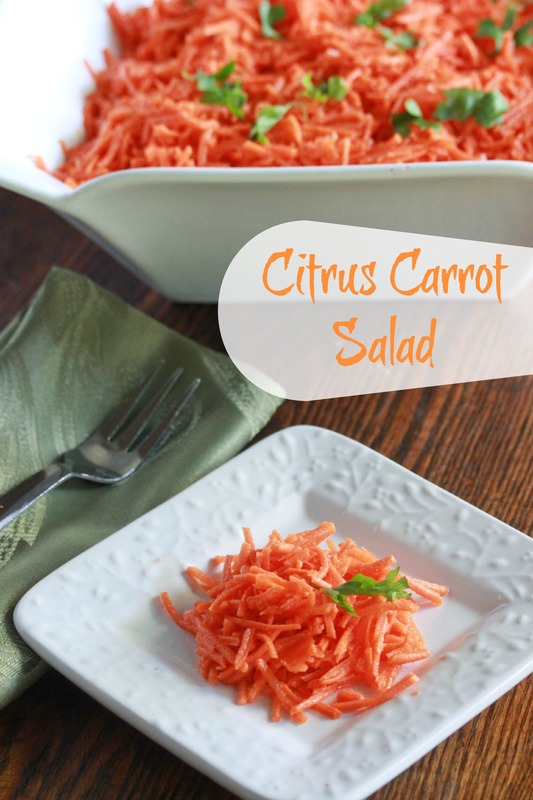 I love the combination of carrots, citrus and cumin in this. 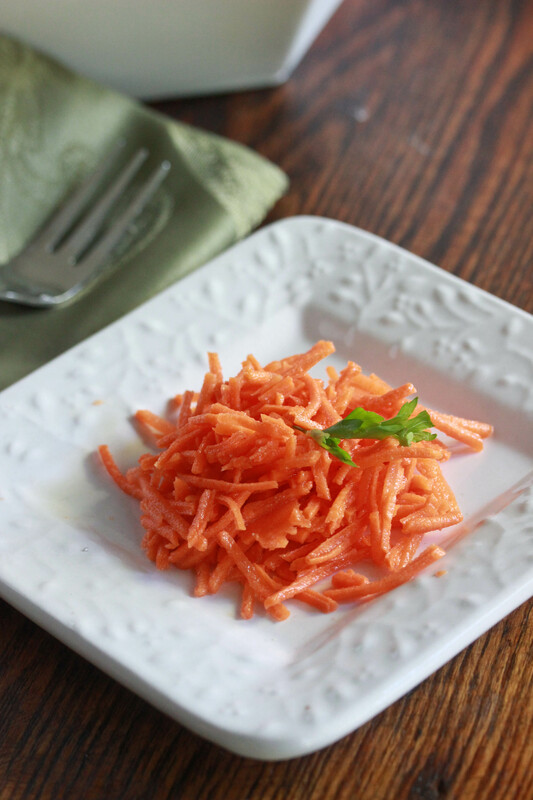 Whether you’re looking for a great way to incorporate carrot into your Rosh Hashanah menu, or you love carrots and want to make a great salad from them, or you want a really simple salad recipe, this is for you. Personally, I’m intrigued by this dressing. I want to try it on a lettuce salad, I love the flavor combination. Talk to me people. What’s your favorite cookbook? 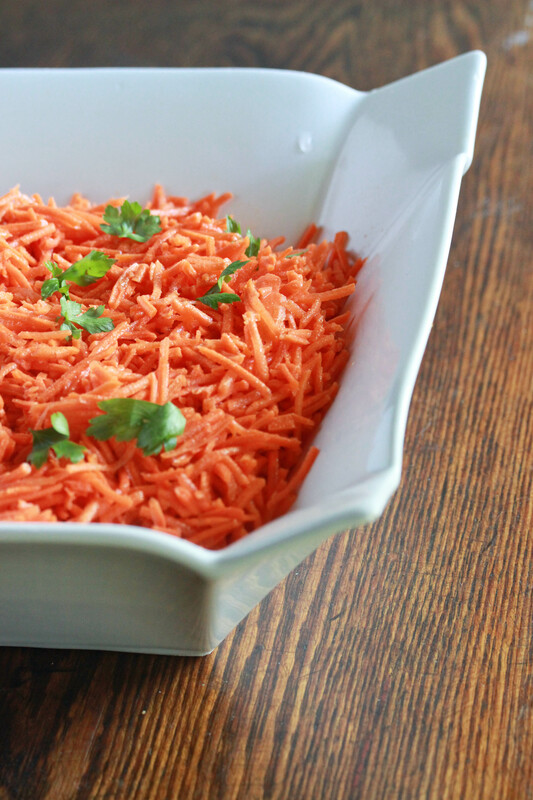 Place the shredded carrots in a bowl, set aside. Whisk together the orange juice, lemon juice and olive oil. Add the cumin, salt and pepper. Pour over the shredded carrots and stir to combine. Optional: garnish with fresh parsley. Easy to make and a recipe that will go over with my family. Can this be prepared in advance? Or would it be better to prepare the parts and add dressing closer to serving time? The carrots will get softer as they sit with the dressing, so I’d say it depends on your preference. I LOVE your blog! I’m so glad I found it while doing a recipe search recently. I already told my family all about it. Can’t wait to actually try some of the recipes. I esecially love the fact that you do most of your baking parve. Most internet recipes are a guessing game as we try to substitute. Simple and delightful salad. Love your salad bowl too. I am a huge Bittman fan. I also have the book and turn to it,all the time, when I need a quick solution for a recipe. He always has the answer. I don’t have a favorite cookbook. I love them all. I like Dorie Greenspan for baking and Nigella for cooking. I use Susie Fishbein for a multitude of recipes. I think each cookbook offers something else for us. Where can I find the recipe for this super salad?